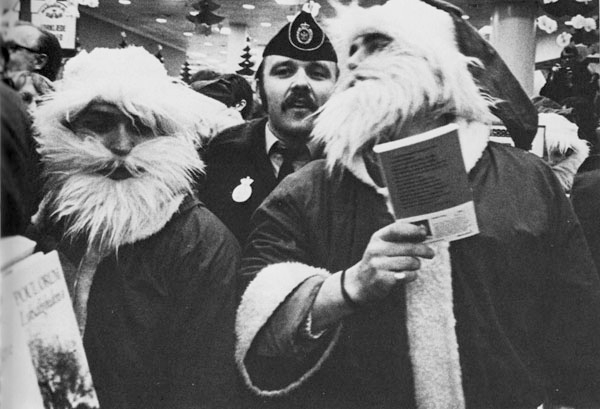 In the lead-up to Christmas 1974, an army of about seventy Santa Clauses, male and female, paraded through the city of Copenhagen, singing carols, handing out sweets and hot chocolate, and asking everyone what they wanted for Christmas. The week-long performance reached its crescendo inside one of Copenhagen’s biggest department stores when the Santas started handing out presents to customers directly off the shelves. Before too long, security guards and shop assistants interrupted the magic, desperately tearing the presents out of people’s hands. The police soon showed up and escorted the Santa Clauses out onto the street, where they were roughed up and thrown into paddy wagons in spite of the fact that it wasn’t clear that a criminal act had been committed, except perhaps on the part of customers who took home the presents without paying. The performance exposed the radical implications of the myth of Santa Claus’ boundless generosity, demonstrating that true generosity is impossible within the narrow terms of capitalist society. With widely distributed photos of Santa Claus getting beaten for being too generous, the action was a hit.